The Pakistani community of London (also called London Pakistanis) consist of Pakistani emigrants and their descendants who have settled in London, the capital city of England and the United Kingdom. Pakistanis in London form the largest concentrated community of British Pakistanis; immigration from regions which now form Pakistan predate Pakistan's independence. Pakistanis in London represent a diverse mixture of South Asian subgroups including Punjabis, Kashmiris, Pashtuns, Muhajirs and smaller numbers of Sindhis and Balochis among others. A substantial number of British Pakistanis who arrived to London in the 1960s were qualified teachers, doctors and engineers. Proportion stating that their ethnic group was Pakistani in the 2011 census in Greater London. Pakistanis in London are mostly Muslims who speak Urdu and Punjabi amongst other languages. The main concentrations of Pakistani settlement in London are found in Outer London with the boroughs of Redbridge, Newham and Waltham Forest accounting for nearly a third of Londoners of Pakistani Descent. The main industries which the Pakistani community of London are employed in include wholesale and retail (including self-owned grocery stores or newsagents). In 2001, 0.6% of businesses in London were owned by British Pakistanis. 20% of London's Pakistani population are self-employed. The percentage of London Pakistanis employed in managerial, senior official or professional occupations is 33%, which is slightly higher than the London average of 32%. It is also higher than the percentage of London Bangladeshis (22%) and similar to the percentage of Indians (34%) and Other Asians (31%). The unemployment rate for Pakistani males and females in London is lower than the national average British Pakistanis living in other regions of Britain. Pakistanis are the only ethnic group (along with White Britions) who have a lower worklessness rate in London than in other areas of Britain. 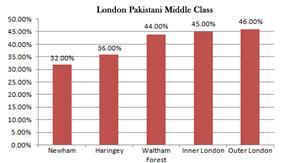 As of 2001, almost equal amounts of Pakistanis in Inner (45%) and Outer London (46%) were middle class. Between 1991 and 2001, out of the total growth in the London Pakistani population, 52.7% of the growth was in the middle classes. Growth in managers and professionals as a proportion was 22.8% between 1991 and 2001. There are stark social differences in Pakistanis living in different boroughs of London. Whilst in Brent and Harrow London Pakistanis are fairly prosperous and mostly Middle Class. The opposite is true in Newham, where they are mostly working class and more likely to suffer from deprivation. Several upper class Pakistanis also live in London, sometimes only for part of the year. The former presidents of Pakistan Nawaz Sharif and Pervez Musharraf currently reside in London. Latest figures available, regarding London Pakistanis, by local authority, dated: year 2004. At Key Stage 2 Pakistani children in London have higher attainment rates in both English and Maths, when compared with the British Pakistani average. In contrast to Pakistanis from other regions of Britain. 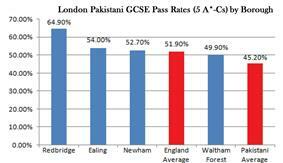 Pakistanis in London achieve above average GCSE Pass Rates. For example, in 2004, 50.2% of London Pakistani boys achieved five or more A*-C grades, compared with the national average of 46.8%. Furthermore, 63.3% of Pakistani girls in London reached that threshold compared to the national average of 57%. The achievement of Pakistanis in London at GCSE level is 10 percentage points higher than that of Pakistanis throughout England. 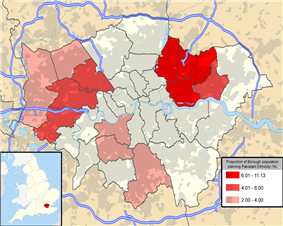 The highest attainment within London was found in the borough of Redbridge. Pakistani applicants to universities are over-represented by 7.5% from Greater London. In education, Pakistanis in London performed the highest out of all British Pakistanis in the 2001 census. 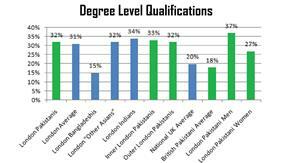 This is not just reflected in above average GCSE pass rates but also in degree level qualifications, with 32% of London Pakistanis having degree level or higher qualifications. This is marginally higher than the London average of 31% and is more than twice as high as the figure for London Bangladeshis (15%), equal to the figure for "Other Asians" and comparable to the figure of 34% for London Indians. Pakistanis in Inner London do slightly better than those in Outer London, with 33% reaching the benchmark compared to 32% in Outer London. The figure is higher than the national average of 20% and almost twice as high as the figure for Pakistanis throughout the UK (18%). Pakistani men are better qualified than the average Londoner, with 37% possessing a degree level or higher qualification, although Pakistani women have fewer educational qualifications, with 27% having the same qualifications. The figure for Pakistani women in London is still higher than the national or British Pakistani national average. In similarity to Pakistanis living other parts of the UK, 91% of Pakistanis in London are Muslims. The other 6% are made up of people who did not declare their religion, Christians make up 2% and those with no religion made up 1%. Pakistanis make up only 22% of London's Muslim population, in contrast to 43% for British Pakistanis living throughout the UK. 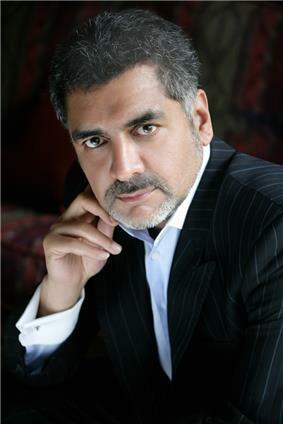 James Caan (born Nazim Khan) - British-Pakistani entrepreneur and television personality. He is best known as a former investor on the BBC television programme Dragons’ Den. Altaf Hussain - British Pakistani politician and fugitive of Pakistan who founded and leads the Karachi based Muttahida Quami Movement (MQM). Anita Anand - British radio and television presenter and journalist. Sir Anwar Pervez - A Pakistan-born businessman who was estimated by The Times to be Britain’s richest Muslim in 2010. Founder of the Bestway Group. Hanif Kureishi - Playwright, screenwriter and filmmaker, novelist and short story writer. Hasnat Khan - British Pakistani heart and lung surgeon identified as an "ex-lover" of Diana, Princess of Wales, who is said to have described him as "Mr Wonderful". Owais Shah - Cricketer who plays for Middlesex and has appeared for England in a number of One Day Internationals and test matches. 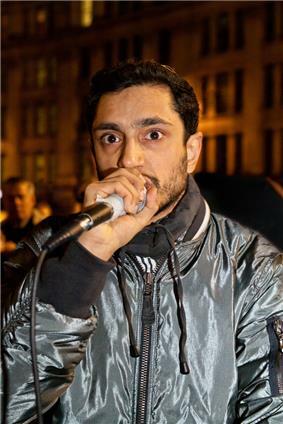 Rizwan Ahmed also known as Riz MC, is a British Pakistani actor and rapper from Wembley, London. He is noted for his lead performances in The Road to Guantanamo, Shifty, Britz, Four Lions and The Reluctant Fundamentalist. Riz Lateef - A news reader for BBC London News and the BBC Deputy News Manager. 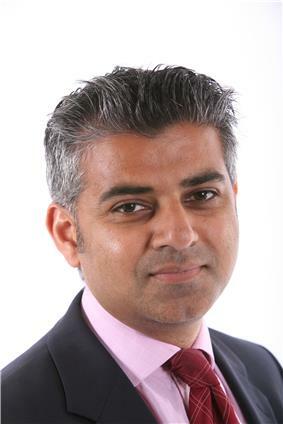 Sadiq Khan is a British Labour Party politician, who has been the Member of Parliament (MP) for Tooting since 2005, succeeding Tom Cox as the Labour MP for the seat. Tariq Ali - A British Pakistani historian, novelist, journalist, filmmaker, public intellectual, political campaigner, activist, and commentator. Mazhar Majeed - A British sporting agent and bookmaker arrested by Scotland Yard for allegedly fixing a Test match between England and Pakistan at Lord's. Nazir Ahmed, Baron Ahmed (born 24 April 1957) is a member of the British House of Lords. ^ "Pakistani London". BBC. 2005-05-26. Retrieved 2009-05-30. ^ a b c Richardson, Robin; Angela Wood (2004). The Achievement of British Pakistani Learners. Trentham Books, in association with the Uniting Britain Trust, Ltd. Retrieved 2009-05-30. ^ "20thcentury Pakistani London". Renaissance London. Retrieved 4 August 2011. ^ a b c d "Pakistani London". ^ "Pakistani community of London". London Assembly. Retrieved 4 August 2011. ^ Meadows, Pam. "Worklessness in London: why is it higher than in the rest of the country?". http://www.london.gov.uk. Retrieved 2009-05-30. ^ a b c d e Philip Cohen and Michael J. Rustin. London's turning: Thames Gateway London's turning, The Making of Thames Gateway. Ashgate. Retrieved 4 August 2011. ^ Pakistani mapping exercise "Pakistan Mapping Exercise". IOM London. p. 11. Retrieved 4 August 2011. ^ Peter Dominiczak (10.09.09). "Pervez Musharraf's London pad surrounded by kebab joints". ^ "Baroness Warsi calls on Nawaz Sharif". Daily Times. May 19, 2010. Retrieved 31 May 2010. ^ a b DSCF. "UK Vision for London 2008 - 2011". ^ Piggott, Gareth (4 January 2005). "2001 Census Profiles: Pakistanis in London". Data Management and Analysis Group. Retrieved 2010-10-15. ^ "Round Ethnic Group Projections". ^ Catherine Boyle (27 March 2010). "Asian entrepreneurs present best way to succeed". London: Times Newspapers. Retrieved 15 July 2011. ^ "ASIAN OF THE YEAR 1997-98 Sir Mohammed Anwar Pervez OBE". Asian who's who. Retrieved 4 August 2011. ^ Hasan Suroor (28 May 2011). "Pakistan is in terminal decline". Chennai, India: The Hindu. Retrieved 15 July 2011. ^ "As 250 Killed in Clashes Near Afghan Border, British-Pakistani Author Tariq Ali on Pakistan, Afghanistan, and the Ongoing U.S. Role in Regional Turmoil". Democracy Now!. 10 October 2007. Retrieved on 11 October 2007.